Making your own holiday gift tags is super easy and fun! Especially when you use unexpected materials like necktie fabric. This tired old tie, for example, has seen its share of holiday parties and I felt it was time for a refresh and reinvention. 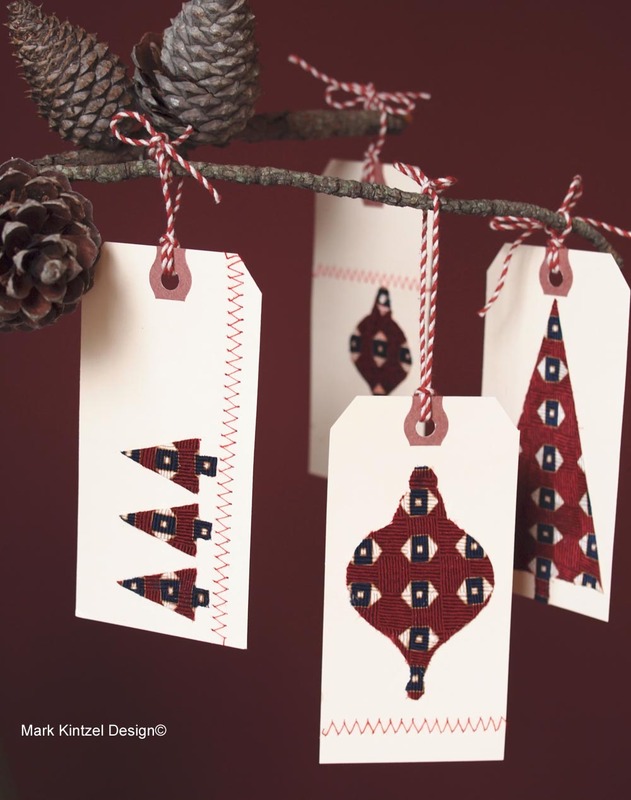 Here’s how you can make holiday gift tags that will stand out from all those store-bought doozies. If you don’t want to part with your cherished ties, you can find some really cool neckties at your local thrift store. Old flannel shirts would work fine as well. As for the shipping tags, you can pick up a box of 100 at Staples Office Supplies. The rest of the project ingredients you can gather at any craft store. Draw some holiday silhouettes onto card stock paper. Be sure to keep them appropriately sized so they fit onto the tags. I kept mine simple so I wouldn’t have any intricate cutting to do. If you don’t want to draw the silhouettes free-hand, you can find some great holiday templates on-line. Make card stock templates by cutting out the silhouettes then place them aside. Use scissor to dissect the necktie by separating the fabric from all of the tie liners and backing. Then iron. Spray a fine coat of spray adhesive onto a card stock template and place it onto the back of the tie fabric. Press firmly and let dry. Using the template as your guide, carefully cut the tie fabric around the shape of the template. Spray the back of the shape you just cut out with spay adhesive and affix it onto the tag pressing hard to be sure it is secure. To give your tags a little more character, run the tags through your sewing machine. Add some holiday ribbon or cord and your done! Note to crafters, this project may seem time-consuming but honestly I completed six tags in about 1/2 hour. Also by affixing the fabric onto the card stock prevents the tie from fraying. Happy crafting and happy holidays!